So, have you heard? I’m going to Bloggy Boot Camp Chicago this weekend! Bloggy Boot Camp Chicago is actually in the suburb of Northbrook. Even though the hotel is not downtown, there are a lot of great places to go in the suburbs! Here is your guide for what to do when you are not attending the blogging conference this weekend, both in the suburbs and in downtown Chicago. 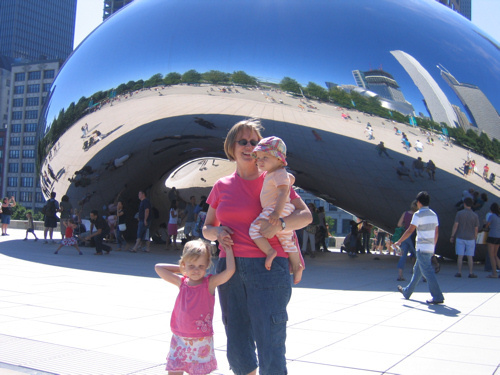 Lily, Emmy and I are in front of the Cloud Gate, otherwise know as the Bean. If you need a bite to eat in Northbrook, there’s no need to go far! Charlie Beinlich’s is not much to look at and their website is basically useless, but they have awesome hamburgers! It is on Skokie Blvd., just down the street from the hotel. If you are looking for something a little fancier, Ron of Japan is also on Skokie Blvd. by the hotel. This Japanese Steakhouse will easily accommodate big groups of women bloggers! The chefs are amazing to watch as they prepare your meal right at your table. 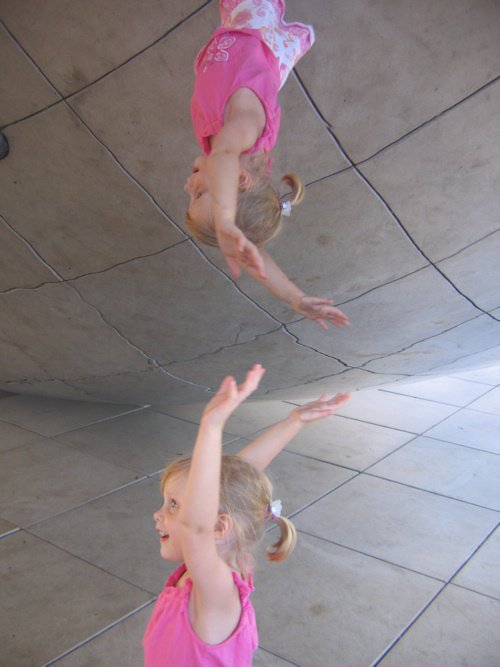 Lily reflected in the Bean. In nearby Highland Park, you can listen to music AND see a movie under the stars! The Chicago Symphony Orchestra is playing at Ravinia on Friday, August 19. Lawn tickets are very reasonable. Just bring a picnic blanket and bottle of wine, and you are set! The CSO will be playing the soundtrack LIVE as you watch The Lord of the Rings: The Fellowship of the Rings on screens scattered around the lawn. Now that will be an awesome experience! They also have other concerts this weekend. Visit their website for more details. 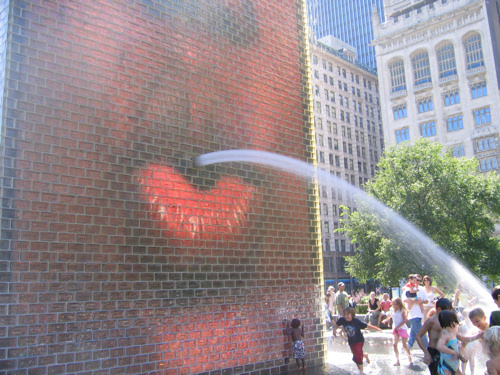 One of the fountains in Millennium Park “spitting” on a group of kids. If you are really excited about being in Chicago, the Loop is just a short drive south on the Edens Expressway, otherwise know as Interstate 94. If you prefer to skip the traffic, Northbrook also has a Metra line that will take you directly downtown. Taking the train might be the best choice since the Chicago Air & Water Show is happening this weekend, and this big event always snarls traffic. If the weather cooperates, Millennium Park is a great place to spend the day. Are you bringing the kids? Don’t forget to bring their swimming suits and they can get as wet as they want to in the fountains! The park is close to shopping on Michigan Avenue and also the Art Institute. 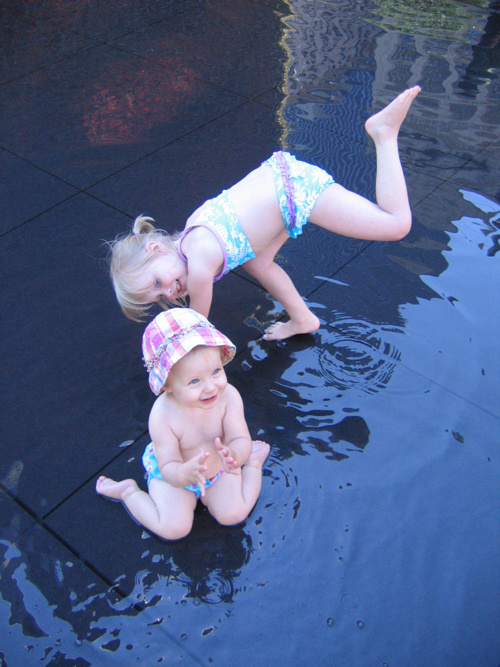 Lily and Emmy, three summers ago, playing at Millennium Park. Have an awesome weekend here in Chicago, and if you are attending the conference, I’ll see you there! ← Bloggy Boot Camp Chicago! I'm definitely feeling homesick.Have a great weekend. I miss Chicago so much!!! I think I'll be there for a quick visit in September or October though!